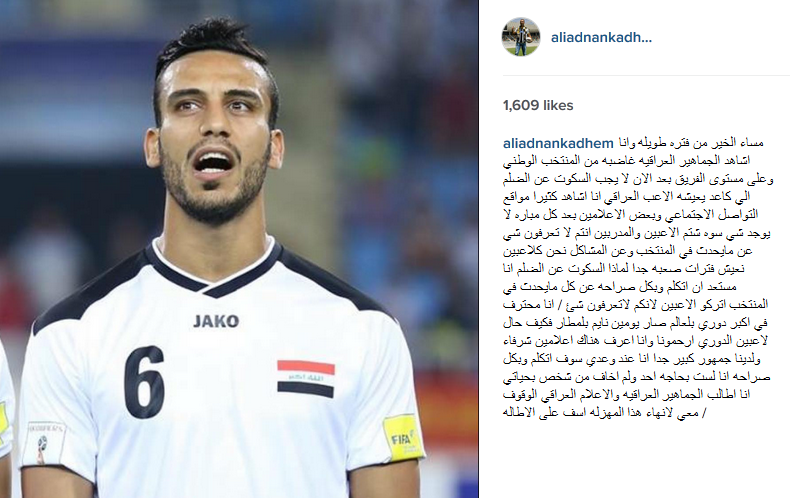 Ali Adnan has attacked the Iraqi Football Federation in a scintillating rant, where he claimed that Iraqi fans are unaware of what the players and the coaching staff of the national team have been put through during recent times. Iraq’s young wingback has started in Iraq’s last three World Cup qualifiers under current manager Yahya Alwan, featuring in a slightly more attacking position than his natural full-back role. The player was notoriously quiet in Iraq’s disappointing draw against Vietnam in their last game. Using his official Facebook and Instagram pages, the Udinese superstar urged Iraqi fans and the media to “stand alongside him to end this farce”. Ali confirmed that he monitors his social media accounts closely, paying particular attention to the comments and feedback left by fans following Iraq’s matches. These claims are not unusual for Iraqi footballers, who have suffered continuously from poor management and disastrous planning under the Iraqi Footballing Federation, Ministry of Sports and Youth and Olympic committee. Nashat Akram revealed to IraqFootball.me that the difficult conditions created for players were a result of negligence and ignorance by those in charge of the Iraqi league and national team. The exclusive interview will be featured on our website within the next few weeks, so make sure you subscribe to our mailing list to be the first to read it. Ali Adnan’s assault has come at a very dangerous time for the Iraqi FA given recent performances and events. Yaser Kasim has just returned to the national team after problems surrounding him and Iraqi captain Younis Mahmoud. Ahmed Yasin was also surrounded by controversy prior to the Vietnam game after being handed economy tickets for his 23 hour flight from Denmark to Vietnam. The player’s text messages to Basil Gorgis were suspiciously leaked, where he told the manager’s right-hand man that he will be unable to attend due to the circumstances surrounding his ticket. The player ended up featuring in the match regardless, although we do not know whether his flight was upgraded or not. Osama Rashid discussed difficulties he’s experienced with the national team, highlighting a lack of communication between the Federation and players. The player was unable to attend the national team’s camp recently due to the Federation’s inability to simply book plane tickets for the player at a convenient time for him. Instead, they ended up booking tickets for him during his match day with SC Farense. The outcome of Ali Adnan’s rant remains unclear, although we do obviously sympathise with the player. Judging by history, we can only imagine that the player will be punished at some point for speaking out against the blatant injustices that Iraqi footballers suffer from. We wish the national team all the best and we hope Ali Adnan continues to set Serie A alight with even more dazzling performances. I’m gone to tell my little brother, that he should also visit this web site on regular basis to get updated from most recent news.